The herb known as ginseng is native to the harsh conditions of Siberia, as well as to many parts of the Asian continent, and it has been used in traditional Chinese medicine for thousands of years. For centuries, ginseng has been used as an energy tonic by the Chinese, who continue to use it for this purpose even today. In the western world, ginseng is being studied for a number of purposes, from treating stress to increasing levels of alertness and mental clarity. Many studies have shown that ginseng is able to reduce levels of stress in both men and women. In many clinical studies of the herb’s effects, those taking regular ginseng supplements were able to withstand higher levels of emotional and physical stress than those who had never taken the herb. In addition to its traditional role as stress fighter, ginseng has shown great promise at reducing fatigue, increasing memory and even fighting off colds, flu and other infections. The herb we know as ginseng contains a number of compounds which seem to be unique to this plant. Many of these unique elements seem to have a strong effect on the adrenal glands, which rest on the top of the kidneys. The function of the adrenal glands is to secrete hormones which are used to ward off both physical and emotional stress. Scientists believe that it is this effect on the adrenal glands that is responsible for the stress fighting power of ginseng. Ginseng is also one of the few herbs that have shown promise in the treatment of chronic fatigue syndrome. This condition has puzzled doctors for decades, and there is no widely accepted treatment for the overwhelming fatigue that typifies the condition. However, those suffering from CFS often report an improvement in their symptoms after taking regular ginseng supplements. 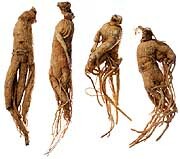 Ginseng is one of the most widely available of all herbal supplements, and one of the most commercially produced. It is important, therefore, for those shopping for a ginseng supplement to choose one made with the highest quality ingredients. It is also important to look for a ginseng supplement which has been processed as little as possible, as excessive processing is thought to reduce the effectiveness of herbal products.